This site will be archived in the coming days and will no longer be updated (except for the Luminous fanlisting). You will still be able to find everything that is currently on this site by going to geniefrancis.net. Hard to believe it's been 15 years (!) 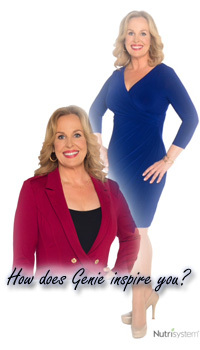 since I created A Place For Genie Francis Fans on geocities.com. Thank you to everyone who has sent me something for this site -- there wouldn't be half the stuff on here if it weren't for y'all. There are too many names to list, but if you're ever looking at pictures or articles or quotes, there will often be a 'Thanks to _________!' nearby to give credit to those who helped make this a pretty cool site. To all the Laura fans, Tyger fans, Brett fans, Diana fans, Ceara fans, Genevieve fans, and the 'I'll-watch-Genie-in-anything' fans (::high-five::), it's been fun! See you at the new site! And don't forget to watch GH for Laura's return this Friday, October 2nd! The Luminous fanlisting has been updated. New (old) photos have been added to the gallery - thanks, Silvia! Due to unforeseen circumstances Genie's event has been cancelled. We know her fans will be disappointed and we are sorry to be sharing this news. Refunds will be issued within the next week or two. Please go to soapstarevents.com if you have any questions. We will be announcing an upcoming event that is in the works soon. The General Hospital Fan Club Weekend (GHFCW) is less than two months away! Click on the flyer below to the get the full-sized PDF. Today is the day Laura returns to Port Charles! Be sure to watch General Hospital and join us on Twitter today and each Friday while Genie is on the GH canvas! We will post a Laura question on our Twitter account (@geniefans) each #FanFriday afternoon and Genie wants to see your responses! Join us in making some fun guesses as Laura's plot line twists and turns, and she intertwines with her family members and other Port Charles residents! We had so many wonderful entries about how Genie inspires you! Thank you so much to EVERYONE who participated! We hope to do another contest soon so stay tuned! If you won please send your address to j_yolles@hotmail immediately so we can get the package in the mail to you ASAP! Genie Francis has returned and can't wait to see her fans again in a Sunday morning gathering! Genie is looking forward to seeing her fans. She had so much fun at her first ever General Hospital Fan Club Weekend Event she's excited to do it again! Please be sure to read the event info before purchasing your tickets. Calling ALL Genie Francis fans... as you may know Genie's birthday is in the month of May, and while everyone enjoys getting gifts on their birthday, Genie would like to give a GIFT TO YOU! We are having a very special May contest to celebrate Spring, Mother's Day, and YOU! Prizes: Twelve entries will be chosen and the winners will receive a Nutrisystem goodie bag and a brand NEW, hand-signed 8x10 Genie photo! The contest will run from today until May 31st. So if you have been wanting to sample Nutrisystem or always wanted to tell Genie how inspiring she has been to you - this contest is for YOU! *Only one submission per person, please. Emails can be sent to j_yolles@hotmail.com. April 29, 2015: GENIE IS RETURNING TO GENERAL HOSPITAL! YES! Genie is returning to General Hospital! We are super excited to see her on our TV screens again soon! Please stay tuned to @geniefans on Twitter for the most current Genie updates and news! Genie looked beautiful at last night's Daytime Emmys! Check out the gallery for photos that Genie shared with us throughout the night! And don't forget to follow Genie on Twitter and Facebook for more photos. For those who missed it (and for those who want to watch it again! ), here is the video of Genie and Anthony Geary presenting at the Daytime Emmys. Enjoy! Hello Genie fans! We hope you are planning to watch Genie present tomorrow (Sunday) night on the Daytime Emmys on the POP TV channel at 8pm EST! Also, we have a NEW and EXCITING GENIE CONTEST that will be announced on MAY 1st so STAY TUNED to this site and @geniefans on Twitter for announcements and updates! The Nutrisystem print advertisement was added to the gallery! Also added to the gallery: a recent mini-article from SID! A longer SOD article from February has been added to the articles list (scroll all the way down!)! Photos and a great summary of the March fan event weekend are now up on the site! Thanks to Linda Rohe (from Coastal Entertainment), Dre, Kerry M., and Tamara C.! Finally, a belated congratulations to the March Trivia winners: Regina A, Emily C & Kate P! To the Genie fans who are going to the events this weekend, have fun! Looks like Genie will be in the magazine First for Women soon! ICYMI, Genie posted a picture from the magazine shoot on her Facebook and on Twitter! Genie has played a mother to many children on the soaps. Please name ALL the children her soap characters have had. Please be specific to which character has which children! Send your responses to Jen at j_yolles@hotmail.com. Names will be randomly drawn from those who correctly answer the question. Good luck! The 2 winners of the February Trivia Contest were Becky H.and Tracey R.! Congrats, y'all! Genie has played a bride on both daytime and nightime television MANY times. Please name 5 times she was not only a bride, but actually got married with vows and the works. If she married the same character twice, please be specific about when using storyline or year. The 3 winners of the January Trivia Contest were LeAnn, Renee, and Cheryl! Congrats! 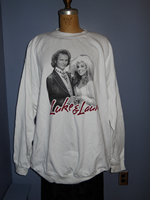 For those curious, the answer was: The Left Handed Boy Storyline was Genie's favorite Luke and Laura storyline. In belated news, check out the gallery for publicity stills from North & South (thanks, Silvia!) and promo shots from Genie's recent appearances on Home & Family! If you missed the Home & Family show with Genie and Jonathan, you can watch it on our Favorites list thanks to Tripe 7 PR's YouTube channel! I hope all you Genie fans had a wonderful holiday! Which of Luke and Laura�s storylines did Genie say was her all time favorite? Send your responses to Jen at j_yolles@hotmail.com. As before, names will be randomly drawn from those who correctly answer the question. Good luck! The 3 winners of the December Trivia Contest were Karen, Tricia, and Regency! Congrats! As always, be sure to keep an eye on our Twitter account for the latest updates and news! For those who weren't able to catch Genie's appearance on the Hallmark Channel's Home & Family Holiday Special, you can watch a segment of it on the Hallmark Channel's YouTube channel! Please list their names as well as give the number! Send your responses to Jen at j_yolles@hotmail.com. Good luck Genie fans! The 2 winners of the November Trivia Contest were Tamara C. and Yasmeen Q.! Congrats! Please send Jen your address and she will get your photo in the mail ASAP! Time flies! Don't forget to submit your answers for the November GENIE TRIVIA QUIZ by the end of November 30th! You could win one of these photos (autographed and without watermarks, of course)! A big thank you to Steven Bergman for letting us use his beautiful photos! Did you miss Genie on the Hallmark Channel's Home & Family show last night? You can give a look at her recipe on their website! Hey all Genie fans! We are having a monthly GENIE TRIVIA QUIZ to get everyone psyched up to spend the weekend in New York & New Jersey with Genie in March 2015! Answer the trivia question correctly and you will qualify to win an 8x10 candid photo autographed by Genie! Winners will be chosen randomly from those who answer the question correctly. There will be two winners each month. Each winner will receive their signed photo in the mail. The contest will run from the 1st to the last day of each month until March 31! Please list all the ACTING projects Genie has partnered with her husband Jonathan Frakes, when they were BOTH onscreen. Send your responses to Jen at j_yolles@hotmail.com. Genie's appearance at Chiller Theatre on April 25-27 has been cancelled. No further information has been given at this time. We will keep you posted when we hear Genie news! Genie will be making a personal appearance at the Chiller Theatre convention in Parsippany, NJ on April 25-27! Publicity photos from "North & South" added to the gallery -- thanks, Silvia! 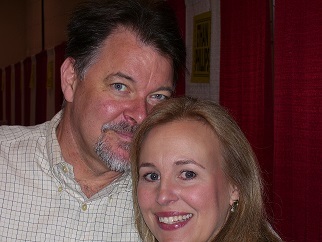 New link added: Jonathan Frakes Fansite! As we wait for Genie news, how about a re-watch of one of my favorite interviews? You can now watch "Intimate Portrait: Genie Francis" on our YouTube channel! And burning question of the day... WHICH soap do you think you will see Genie next? General Hospital or The Young and the Restless? What do you think? We get the feeling that we will ALL find out soon!! Photos from the fan event in July have finally been added to the gallery! Thank you Danielle for many of these wonderful pictures! Hope everybody going has a great time during the General Hospital Fan Club Weekend, especially those attending Genie's event! Please note: This will be the ONLY actor/actress event Genie will be attending. Be sure to catch Genie on Good Morning America this Friday (April 5th) and on 20/20 this Saturday (April 6th). Check your local listings for channel and time! For more up-to-date Genie news, be sure to follow us on Twitter! SOAPnet will be running a GH marathon starting tomorrow, March 29th, at 10PM EST! A few images added to the gallery! New mini-articles and pictures added to the gallery! Genie will be on the Rachael Ray Show this coming Tuesday, March 12th! Here's a sneak peek! Screencaps from "Murder, She Wrote" added to the gallery! Thank you, Silvia! Great animated gifs also added - five of Brett (thanks, Silvia! ), one of Laura/Scotty! North & South clip added to our YouTube Channel! Like puzzles? Try your hand at these fun puzzles by Silvia! Added a bunch of older and more recent photos to the gallery! No more dry spell - Laura will be on tomorrow's GH! If you missed Genie on The Chew yesterday, you can watch it on our YouTube Channel! Beautiful new photo of Genie has been added to the gallery (and our new header!)! Thank you to Magic Bus Photography! Two mini-articles added to the gallery! Be sure to check out our YouTube channel for the latest video clips! If you missed Genie's appearance on "Katie," you can find it there! Links to several recent audio/TV interviews are now up! If you're on Twitter, don't forget that Genie will be live-tweeting during General Hospital this coming Monday, February 11th at 2PM EST!! Wonderful Brett music videos added to YouTube - thank you, Silvia! New animations and a mini-article added to the gallery! Genie was on Access Hollywood yesterday and will be on Katie Couric on February 14th! Great episode stills posted by Entertainment Weekly! For the most current updates, be sure to follow us on Twitter (link to the right -->)! Has everyone seen the General Hospital promos for Genie? She looks gorgeous! There is one from SOAPnet and one that aired on today's General Hospital! Added 3 icons/avatars from the promos (made by me) to the gallery - if anyone has any fan art they'd like hosted here, let me know! Three more North & South video clips added to our YouTube channel - thank you, Silvia! Thank you to Silvia for more Brett & Billy video clips now added to our YouTube channel! New Laura & Stefan link added! Update 1/17: POSTPONED until February. 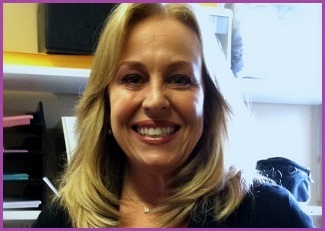 Be sure to tune in to On Air with Douglas on blogtalkradio.com to listen to their best guest yet - Genie Francis! This site's very own Jen will be co-hosting! Thank you to Silvia for the beautiful North & South screen captures now added to the gallery, and for the new N&S gifs! Congrats to Cathy, Wendy, and Yasmeen, winners of the L&L sweatshirt giveway! You should have received an email from Jen and will hopefully receive the sweatshirt by the end of the year. Happy Holidays! Screencaps and publicity photos from "Terror in the Shadows" added to the gallery - thanks, Silvia!! Genie fans! Want to win an L&L sweatshirt (size XXL) to keep you warm for the holidays? We have 3 to give away! Just email us or retweet us by Thursday, December 13th to enter! One entry per fan. 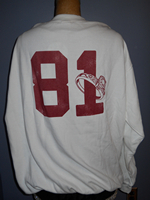 Thank you to The Cherished Home for donating these sweatshirts before the store closed. Two North & South publicity photos added to the gallery - thanks, Silvia! The gallery was updated with screencaps of Genevieve's last day in Genoa City, various Genie photos, and fan art by Silvia! Six articles (5 from the 80s, 1 from last month) added to the site - we now have 100+ articles! Genie's last airdate on The Young & the Restless was yesterday, November 2nd. We will miss Genevieve! If you weren't able to catch all the final episodes this week, they are still available online at CBS.com. Five images added to the gallery - thanks, Silvia! Let's show Genie some love at the Y&R studio, yes? Lovely mini-articles added to the gallery! Y&R screencaps for June 2012 are complete in the gallery! Don't forget to follow us on Twitter for the most up-to-date Genie news! Screencaps from misc. Laura&Stefan scenes have also been added - thank you to Tori for compiling/saving these images! Congrats to the winners of The Note trilogy DVD sets - Janet, Diana, Stephanie, Jhill, and Deanna! Thank you to all who entered and watched - we hope you enjoyed the movie as much as we did! Okay, Genie fans! The question from "Notes from the Heart Healer" is: What is the name of the town where Peyton and King spend their first anniversary? Send your answer to beckytm@yahoo.com by Sunday, May 13th at 9PM PST / 11PM CST / 12AM EST. (1) Watch "Notes from the Heart Healer" on its premiere night, THIS Saturday, May 12th. (2) Come here to see the question from the movie. It will be posted at 10PM PST/ 12AM CST/ 1AM EST - to give West Coast fans a chance to see the movie, too! (3) Send your answer to my email by Sunday, May 13th at 9PM PST / 11PM CST / 12AM EST. (4) Keep your fingers crossed! Five winners will be randomly selected from the entries received with the correct answer. Winners will be announced Monday, May 14th! Good luck! We are VERY excited to once again bring you an exclusive interview with Genie! The interview was done via Skype, so our apologies for the not-quite-synced audio. We don't think you'll mind, though, as Genie talks about everything from The Heart Healer to Y&R to her upcoming birthday!